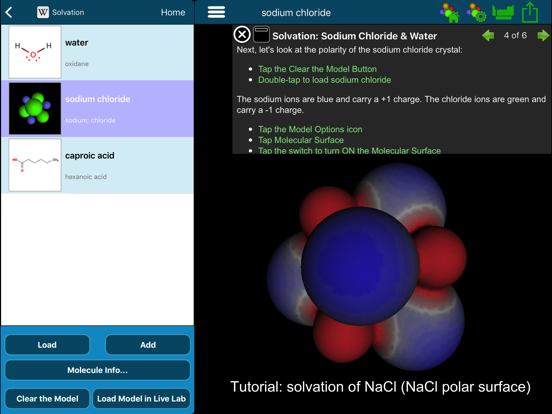 Atomsmith Molecule Lab is an app that will improve your understanding of chemistry. Learning (and teaching) chemistry presents a unique challenge: it depends on the ability to "see" 3D shapes and interactions of molecules we can't actually see -- they are too small. Scientists use 3D simulation and visualization models, based on published science, to overcome this challenge. Atomsmith Molecule Lab makes these particle models accessible to everyone, enabling students of science to interact with molecules and to perform experiments at the atomic scale. Because Atomsmith Molecule Lab's models are 3D, physically accurate, and interactive (NOT 2D animated cartoons or videos to be watched passively), you can use it to do real science, and by performing hands-on experiments yourself, you learn real science. It's the perfect tool to satisfy the Next Generation Science Standards' requirements for digital media, modeling and data interpretation, in conjunction with illustrating the structure and properties of matter. 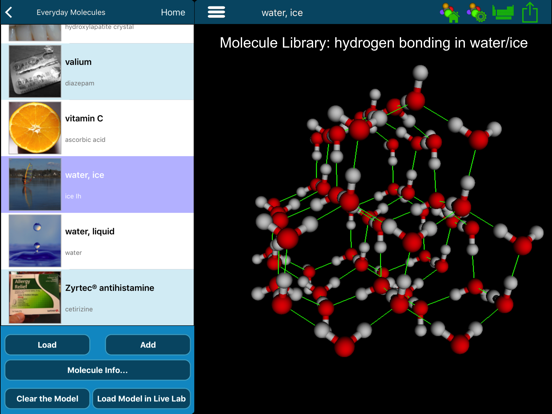 Atomsmith Molecule Lab contains a library of over 600 3D, physically accurate models of organic, inorganic and biological molecules and crystals. View these molecules in 3D, observe their bonding, build crystal structures -- spin them around, zoom in or compare them side-by-side. Use the 3D Lewis Structure Model Type to learn about the shapes predicted by VSEPR theory and the polar surfaces to study polarity. Molecules are in constant motion and they interact with each other via electrostatic forces. 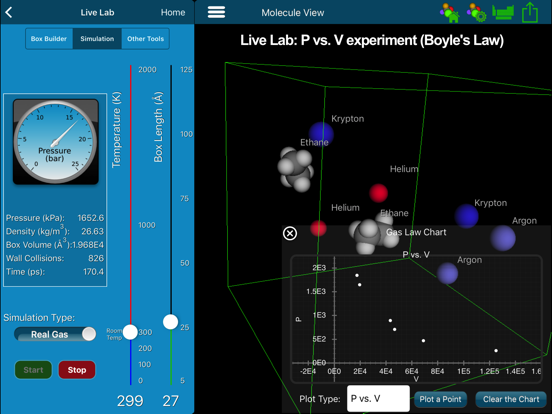 Put molecules into the Live Lab's "virtual box" and run simulations that allow you to see these motions and intermolecular forces (dispersion, dipole-dipole, hydrogen bonding). Then perform experiments on the molecules as you vary the composition, temperature, volume and pressure of the simulation. You can use the Live Lab to explore ideal or real gases, intermolecular forces, solvation, and phase changes. Use the built-in tutorials to perform experiments on ideal gases to "discover" the gas laws. Then turn on the intermolecular forces and see phase changes and learn how they depend on intermolecular forces. 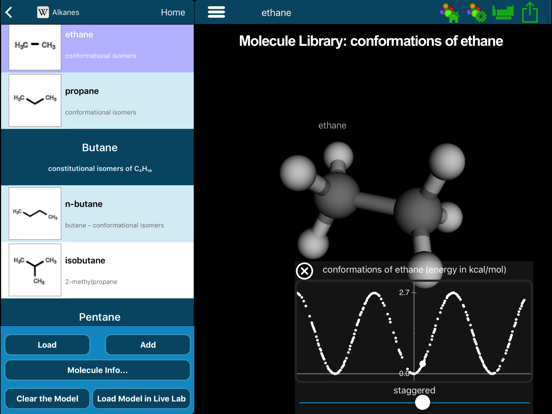 Atomsmith Molecule Lab's Reaction Library contains a collection of interactive, 3D molecular-level models of many common types of chemical reactions. Observing the reactants rearranging into products provides a visual connection between the symbols of chemical equations and the particles that they represent. 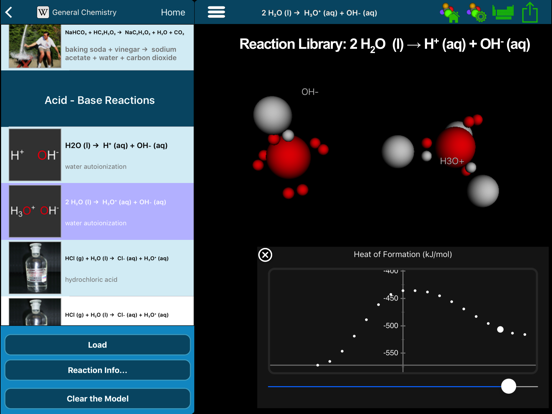 You can use the Reaction Library to animate the 3D pathways of reactions to see chemical bonds as they break and form. Also, track the changes in heat of formation to learn about endothermic vs. exothermic reactions. • Onscreen tutorials walk you through the steps of how to use the Molecule Lab to explore a broad range of concepts in general, organic and biological chemistries. • An exhaustive glossary puts simple, clear explanations of many terms and concepts at your fingertips. • A News feature links to current news articles about molecules in everyday society and commerce. Read the news, then examine models of the molecules in the Molecule Lab. • A periodic table to reference as you study atoms and molecules. • Teachers: Download worksheets that students use to make predictions, perform experiments, and record observations. Contact us via the Molecule Lab home page for more information. View product features from the About page.